These days it seems that personal branding is a such a common term in the world of business — this is especially true if you’re the face of a company. Ultimately how you present yourself is a reflection of both you as an individual and your organization. You’re remembered for a select few qualities that anyone who knows you automatically associates with you. It’s a reflection of your organization since it communicates to those who interact with it what the organization stands for. Has it been a while since you’ve thought about your personal brand? Having a clearly defined personal brand makes you more memorable. Being more memorable keeps you first of mind when somebody comes across an opportunity that would make sense for you. Why does this matter? Well, if you work in a competitive field or run your own business this can be a huge advantage. You’re the first person people think of when an opportunity comes up because you have a well defined personal brand. As they get to know you and become familiar with your specific personal brand they associate certain qualities with you are and what you stand for. This includes how you dress, your character, and your behaviour. How would you like to be perceived within the first few seconds of meeting someone? What qualities would you like your image to portray about you if you didn’t get a chance to speak to someone at a party or networking event? In an ideal world what would your ultimate personal brand look and feel like? Who are some people you draw inspiration from? What qualities about them do you like most? What’s been holding you back from defining your personal brand? One of the most common mistakes men make when defining their personal brand is not actually taking the time to define it. Being well-versed in your field is great but will only get you so far. You don’t want to be another face in the crowd do you? You’re already heading in the right direction by reading this. At the end of day it comes down to being honest with yourself and what you’d ultimately like your personal brand to stand for. So don’t hold back! A wise man once said, “Success leaves breadcrumbs.” There’s no need for you to reinvent the wheel. Take your time, do your research, and see what other successful men have done to define their personal brands. This is where many people let themselves down. They start out defining their personal brands by free-styling it and hoping that something sticks. Taking this approach often leads to people giving up or producing inconsistent results because they’re operating from a shaky foundation. Stay clear of these mistakes when defining your personal brand and you should be all good. Keep in mind that this isn’t an overnight process. Building your personal brand takes time. Think about some of your favourite business brands (Starbucks, Apple, Nike, BMW, etc.) what have they done to win you over? There’s a good chance that you weren’t hooked after seeing one commercial or billboard. These brands built trust with you over time and eventually you bought into what they were selling. Your personal brand is no different — people associate specific traits with you based on your image, character, and personality. We only have a few seconds to establish a first impression. In the world of social media it’s even less. The advantage of defining your personal brand in the digital world is that we have the power to curate the content and steer it in our desired direction. Once again, personal branding is done consistently over time and requires disciplined action coupled with a clearly defined end goal. A simple way of distinguishing your personal brand from others is by adding eye-catching accessories. That’s what I did to position myself as someone who’s well versed in men’s style. For years any picture that I posted of myself would include a bow-tie and a suit. Eventually people caught on and a friend of mine who works in marketing even asked me about it back then. More recently I’ve made a subtle shift away from that (mainly because I rarely wear bow-ties these days) since my personal brand has been established. 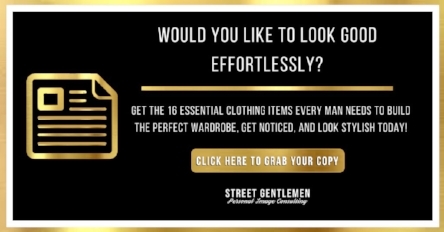 If you’re looking to go down the signature accessory route, check out Adesso Man (feel free to use StreetGent15 to save 15% on your purchase). After reading this you’re now well prepared to define your personal brand. You now know why it’s important, certain mistakes to avoid, and questions to ask yourself when defining it.